It may be known today as the largest and oldest payer group in the United States, but the Blue Cross Blue Shield Association (BCBSA) used to be two different organizations. One was called the Blue Cross Association, and the other the Association of Blue Shield Plans. These two had separate paths of development—paths that intersected when they merged in 1982, forming BCBSA. Currently, the BCBSA has at least 106 million members across the country (plus its federal territories). Member companies have contracts with more than 96 percent of the nation’s hospitals, and over 93 percent of all doctors belong to the BCBSA network (1). Compared to figures posted by other insurers, BCBSA remains unmatched. With the association’s extensive reach, it’s hard to imagine that a century ago, health insurance was not an option. It did not exist. Access to quality health care was limited, with most ordinary Americans not being able to afford it. Hospitals and doctors, for their part, lacked the financial resources for certain medical practices, solutions and technologies. But thanks in large part to Blue Cross and Blue Shield companies, the concept of health insurance was born, benefiting American society in myriad ways. From pre-paid group practices where plan members gained access to an array of medical services via a selected network of providers, Blue Cross and Blue Shield paved the way for health insurance as we know it today. Undoubtedly both also played important roles in the surge in healthinsurance coverage between 1940 and 1955, during which the segment of the population with coverage increased from less than 10 percent to almost 70 percent (2). 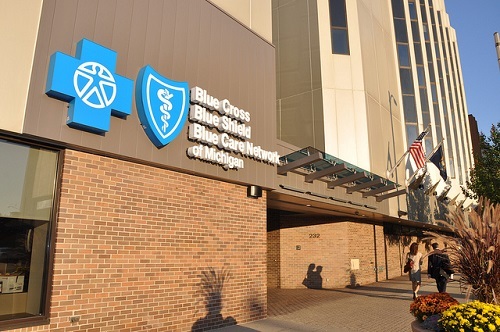 Blue Cross was formed first, with its roots dating to 1929. It was designed to provide prepaid coverage for hospital care services. The plan was actually based on a prototype created by Justin Ford Kimball. Kimball was vice president of health care facilities at Baylor University in Dallas, Texas, when he came up with a plan that granted teachers 21 days of hospital care access care for a cost of only $6 per year (3). This is widely considered the world’s first-ever prepayment plan in hospital care. It caught on fast, adopted initially by other Dallas-based employee groups before spreading on a national scale. From more 1,300, Blue Cross members reached 35,000 by 1933, during which Blue Cross plans numbered 16 (4). More and more plans were introduced in the years that followed, and in 10 years’ time Blue Cross was already covering 3 million individuals (2). The plans became recognized throughout the country by the Blue Cross symbol, which, as one historian put it, “perpetuated itself as a unifying force” (2). The origins of this symbol are traced back to 1934, when E.A. van Steenwyk commissioned Joseph Binder, a Viennese artist, to create a poster with a solid blue Greek cross painted on it. Steenwyk, who was at the time executive secretary of the Hospital Service Association, used the design as an identifying element for the company’s hospital care program and health plans. In 1939, the American Hospital Association (AHA) tapped the Blue Cross symbol as an emblem for all standards-compliant health plans in the United States. By 1960, however, the Blue Cross Association superseded the AHA commission. Blue Cross ended its ties with AHA in 1972, and in 1973 the AHA seal that appeared along the Blue Cross symbol was replaced by a silhouette of a human figure stylized to symbolize humanity. The first official Blue Shield plan emerged in 1939 in California, ten years after Blue Cross was established. While Blue Cross focused on hospital care, Blue Shield was developed as a way of covering physicians’ services. The concept behind this plan was inspired by employers of the mining and lumbar camps located in the Pacific Northwest. Hazards of the job made workers there prone to chronic illnesses as well as serious injuries, so making medical care easily available and accessible was a must. Employers made this possible by paying physicians a monthly fee for their medical services. The arrangement gave rise to “medical service bureaus,” which brought together physicians to provide this kind of service. Pierce County physicians organized the first medical service bureau—the Pierce Country Medical Bureau—in Tacoma, Washington, in 1917. The bureau exists to this day, although it is now called Regence BlueShield. This pioneering system laid the groundwork for Blue Shield, which was built around the goal of reimbursing services rendered by physicians. The Blue Shield symbol was created in the same year that the Blue Shield plan was formally introduced. Carl Metzger, head of the Blue Shield Plan in Buffalo, New York, had its design commissioned. The symbol, which features a serpent and the U.S. Army Medical Corps insignia, was meant to represent this new medical service plan and establish its link to the companion hospital plan. Soon after it was launched, it became a fixture in a growing number of Blue Shield plans. Among those that adopted the Blue Shield was the Associated Medical Care Plan, which began using the symbol in 1948. This group of nine plans would later become known as the National Association of Blue Shield Plans. Blue Cross and Blue Shield merged in 1982, and since then the Blue Cross Blue Shield Association has worked to provide personalized health coverage in every state and federal territory. Now its coverage extends to nearly one-in-three Americans. The association is composed of 36 U.S. health insurance companies and organizations. These franchises operate independently of the association and are community based. As licensees, they provide health insurance plans under either association’s brands and within specified regions. The forms of coverage may differ, but residents in each state can enjoy access to some kind of coverage. In addition, Blue Cross and Blue Shield companies are among the U.S. government’s major partners in administering Medicare, a health program designed for the country’s disabled and elderly population. The partnership dates back to the 1960s, when the Medicare bill was signed into law by then-President Lyndon B. Johnson. The government relied on the established infrastructure of Blue Cross and Blue Shield organizations to keep the new program from being too cost prohibitive. Successfully launched in 1966, Medicare began with over 19 million participants.At present, the services of Blue Cross and Blue Shield companies reach an estimated 42 million Medicare participants (2). The Blue system, in fact, processes the most number of Medicare claims throughout the country (4). Blue Cross Blue Shield plans also cover more than 50 percent of state government employees and retirees as well as their families via the Federal Employees Program.The program, which was created following the enactment of the Federal Employees Health Benefits Act, has about 5.6million members (1). No other national carrier covers as many workers and retirees along with families as the Blue system does. This isn’t surprising as both Blue Cross and Blue Shield made organizedlabor a priority ever since they were established, encouraging the American workforce to actively participate in the health care system. On the whole, enrollment in Blue Cross and Blue Shield plans has been on a rise, with the number of memberstopping 34 million in 1996 and reaching 88 million in 2003 (4). Blue Cross and Blue Shield may be merged under the Blue Cross and Blue Shield Association in the majority of states. In California, however, Anthem Blue Cross and Blue Shield of California are two separate—and competing—health insurance companies with large networks. Available in all counties, their Preferred Provider Organization(PPO) and (Health Maintenance Organization) HMO networks both consist of 400 or so hospitals and approximately 50,000 doctors (5). The key difference between them lies in the fact that Anthem Blue Cross is a for-profit carrier while Blue Shield is a non-profit organization. Anthem Blue Cross is also bigger in terms of members (to date, it has about 8.3 million enrollees) and number of health insurance applications (6)(7). The company caters to the individual, small group, large group and senior markets, offering a full and diverse range of options that include dental, disability, vision and life coverage. In addition, the National Committee for Quality Assurance gave Anthem Blue Crossfullaccreditation, making it the only PPO in the state to ever earn that recognition (8). As a non-profit entity, Blue Shield of California is big on ethical values and on giving back to the community. At times, it also provides wellness discounts and credits to members. And as one of the independent members of the Blue Shield Association, the organization has access to the Blue Shield HMO and PPO network, allowing it to offer affordable prices to those from the small group, Medicare supplement and individual markets. Even though they were developed as separate entities with distinct goals, Blue Cross and Blue Shield have long been a part of many Americans’ health care journey. They have found their way into homes and offices throughout the United States. And they’re here to stay, providing proper and quality medical care to their members, fostering ties with hospitals and doctors, and constantly seeking ways to improve their services and make it more accessible to even more Americans. Wendi Garcia. "Difference Between Blue Cross and Blue Shield." DifferenceBetween.net. February 1, 2017 < http://www.differencebetween.net/science/health/difference-between-blue-cross-and-blue-shield/ >.